The 100: Count ONLY Sugar Calories and Lose Up to 18 lbs. in 2 Weeks is the latest book by New York Times bestselling author, Jorge Cruise. His goal is to provide straightforward weight loss plans that make it effortless for busy people to release excess pounds. 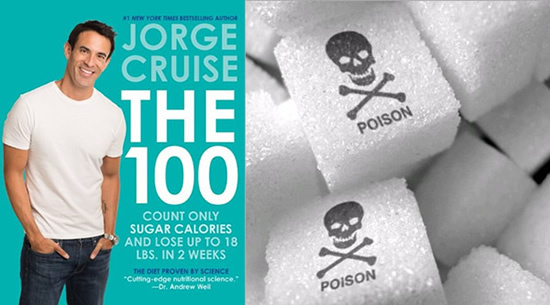 In his latest offering, The 100 Sugar Calorie Diet, he reveals what he says is the true cause of obesity – counting the wrong calories. On this simple, fast and satisfying weight-loss plan you only need to keep track of sugar calories to lose up to 18 pounds. The basic concept of the plan is that all calories are not created equal. To lose weight you don’t have to count calories. It isn’t necessary to limit your intake of food. You can enjoy unlimited amounts of certain foods and still drop pounds without feeling hungry or deprived. Cruise explains that you only need to count your sugar calories to guarantee effective and rapid weight loss. Each day you are permitted 100 calories from sugar. In effect this is a low-carbohydrate diet because when Cruise he refers to sugar this includes all carbohydrates. So foods like fruit, starchy vegetables, bread and pasta must be taken into consideration when keeping track of your 100 sugar calories. Cruise provides a list of foods that he calls “freebies”. Freebies are foods that have zero sugar calories. These foods don’t need to be counted but you still need to stick with the suggested portion sizes. So while you can’t really eat them in unlimited amounts it isn’t necessary to strictly measure your intake. The book includes a four-week meal plan with a shopping list for each week. You can choose to follow a strict meal plan. Or you can mix and match menu options if you prefer more flexibility. Each day you will eat three meals and two snacks. You are also allowed to have 1 or 2 glasses of red wine every day as a treat. Eggs, cheese, bacon, tuna, shrimp, salmon, tilapia, chicken breast, steak, lettuce, tomato, green beans, asparagus, broccoli, red pepper, zucchini, avocado, lemon, pickles, walnuts, pumpkin seeds, macadamia nuts, olive oil, mayonnaise, half-and-half, red wine, coffee, stevia. Cruise claims that you don’t have to exercise and it may actually be counterproductive because it increases your appetite. Nevertheless exercise is a valuable addition to a healthy lifestyle. Strength training is better than aerobics because it boosts your metabolism. However, you are encouraged to partake in any physical activity that you enjoy. Update: Cruise has now created an exercise plan to accelerate fat loss called, Inches Off Your Tummy . The 100: Count ONLY Sugar Calories and Lose Up to 18 Lbs. in 2 Weeks retails at $25.99. Only requires measurement of 100 sugar and carbohydrate calories. Weight loss generally occurs rapidly on calorie-controlled low-carb diets. Includes a four-week meal plan. Hunger and cravings are reduced after the first few days on a low-carb diet. Offers guidelines for how to eat after the four-week program. Eliminates many healthy foods including fresh fruit, legumes, and whole grains. Some dieters may experience side effects including bad breath, constipation, headaches, and fatigue. The majority of dieters who attempt low-carb regimes tend to regain the weight within the first twelve months. Not suitable for dieters who have been advised to limit their fat intake. The 100 Sugar Calorie Diet is a four-week low-carb diet plan that provides detailed guidelines of what to eat at every meal. You don’t need to count the calories of everything you are eating – only the foods that contain carbohydrates. Like most other low-carb diets, this plan works because it reduces appetite leading to a lower calorie intake. However it is still necessary to monitor portion sizes in order to obtain the desired results with this program.